Heritage Palms Country Club, like most 55 and over adult communities, has an active list of social activities..literally something for everyone. The Homes and Condos are oriented around a gorgeous Par-72 Championship, Arthur Hills designed, Public Golf Course. Located in the very desirable Western part of Indio, the community is approx. 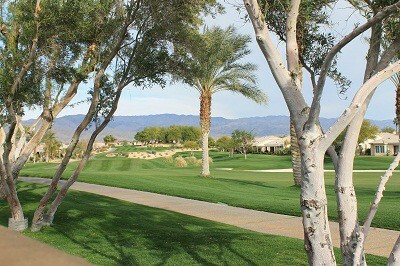 10 minutes from Hwy 111 which takes you straight into La Quinta, Indian Wells, Rancho Mirage, Palm Desert or Palm Springs. Need to get to the Airport? You are about 10 minutes away from Interstate 10 and about 35 minutes from the Palm Springs Airport. A low monthly HOA fee, ($350/mo. ), covers your front yard landscape and also cable TV. Best of all your monthly dues include unlimited use of the 32,000 sf clubhouse, fitness center, tennis grill and an incredible indoor/outdoor pool which overlooks the golf course! Public pay as you play Golf or annual golf passes available. Heritage Palms Country Club offers both Condos and single family residences built between 1996 and 2004. Floor plans range from 2 bedroom homes of approx. 1300 sf, to 3 bedrooms in approx. 2600 sf. Homes include 2-car garages and golf cart garages also. Prices range from approx. $200,000 – $500,000. Homes are available both on the Golf Course, or non-golf course for those who prefer peace and quiet and privacy over Views.  Popular Clubs Onsite: Tennis, Book, needlework, RV, Garden Club and several different card game clubs.